(Click image to enlarge) Welcome!! We're Glad You're Here! If you've found your way here, undoubtedly you love the game of chess as much as we do... of course if you're new to chess, Downloading and using ChessRally 2 is great and fun way to get started! With rave reviews from the most prestigious software websites on the Internet (left) and over 1,000,000 downloads since the initial release, ChessRally is quickly becoming the MOST POPULAR chess software on the planet! So join the fun and DOWNLOAD TODAY! ChessRally 2 Gold Edition is the Premiere Chess Game for the Microsoft® Windows® platform. With ChessRally 2, you can play chess with your friends and family with more flexibility than any other chess software available. Join us in our Online Rally Rooms (Chess Servers) to play or watch chess games, engage in lively chat, and just have tons of fun... you can even get personal chess playing instruction from one of our Live Tutors! You can also play the best Email Correspondence Chess ever created, or play one-on-one a over the Internet or Local Area Network with a friend through a peer-to-peer Direct Network Game. Not only that, but you can also play against a computer opponent with several challenging levels of skill! ChessRally 2 was designed for all versions of Windows®, from Windows® XP down to Windows® 95 and 98. ChessRally has it all! Download This Chess Game Today! For a complete version history, click here. January 14, 2010 - ChessRally 2.6 Build 925 FINAL Released!! Download ChessRally 2.6 Build 925 Now! January 8, 2010 - ChessRally 2.6 Build 923 BETA 3 (Release Candidate) Released!! An important (and probably final) update to the 2.6 Beta releases... this version fixes adds a couple of last minute enhancements, a couple of minor glitches that users found, along with full support for the new animation technologies available to theme authors, and demonstrated in Ingenuware's brand new "Star Battle" theme... the first theme to not actually use chess pieces for pieces! November 29, 2009 - ChessRally 2.6 Build 920 BETA 2 Released!! 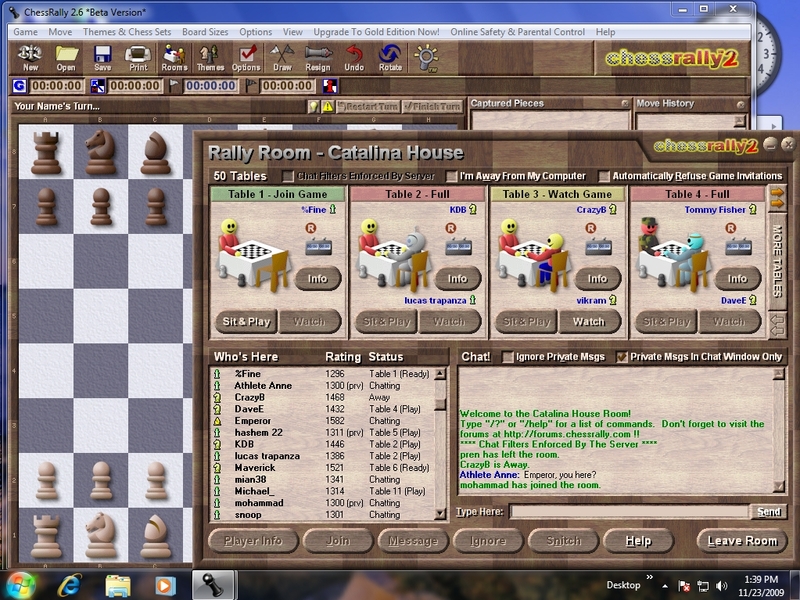 November 23, 2009 - ChessRally 2.6 Build 916 BETA Released!! At long last... the beta version of ChessRally 2.6 is ready and available for download. If you are interested in testing the beta release, please download it and give it a try. All content on this website is Copyright © 2001-2010, Ingenuware, Ltd. All Rights Reserved. ChessRally™ and Ingenuware™ are Trademarks of Ingenuware, Ltd.
All "non-Ingenuware" trademarks and content are the Trademarks and Copyrighted material of their respective owners.